Over recent weeks we've been adding a lot of interesting things (we think!) 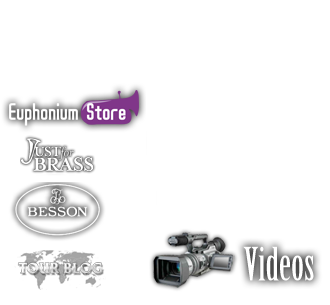 to euphoniumstore.net, including sheet music for the ITEC2012 solo competitions, new euphonium publications from leading publishers, the new Travel Mute, the Breathing Gym book and CD, tuners, cleaning brushes, new CDs, as well as special offers. The MeadSprings are continuing to win new admirers every week. We also stock the complete range of SM and Ultra mouthpieces, in both silver and gold plate. The Beautful Sounds double CD is there too, of course. Please take time to visit the store and have a browse around. 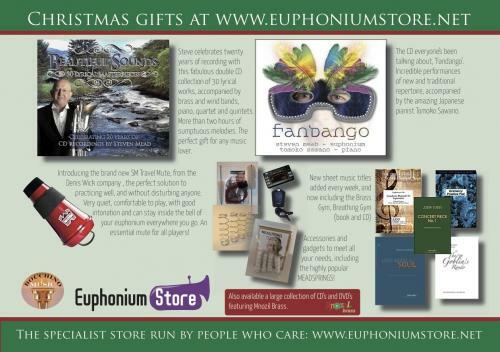 Christmas is coming and if you're looking for the perfect gift for a euphonium playing friend, or need suggestions to give to other people to buy for you (! ), maybe this is the place to shop. If you have any special requests please don't hesitate in contacting me.